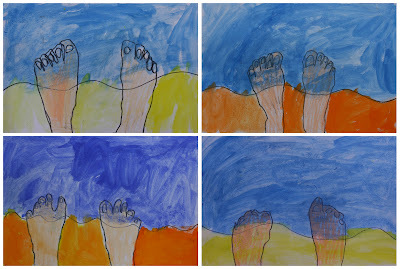 The night before I was called in to take this kindergarten class for the day, I came across Standing at the Edge of the Water by Helena Wurzel. I really like it. I hadn't planned to use it as a lesson so soon but it was a warm Spring day (34 degrees celsius to be precise) and we had some time, so we dove right in... I mean tiptoed in! As it was a bit of a spontaneous lesson, I'd like to improve my delivery next time. 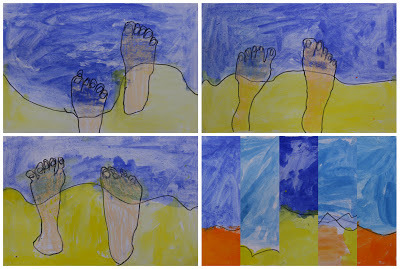 The classroom had no smartboard to display the art with, so these were created sight unseen. This would be the most important improvement — to show and discuss the artwork being imitated beforehand. 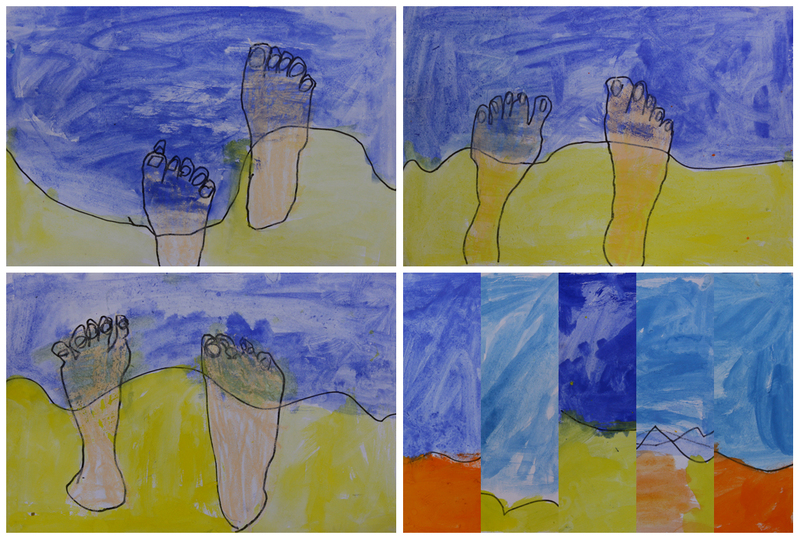 I'm not usually a fan of copying an artwork so directly, but as we say in our house "rarely say never". 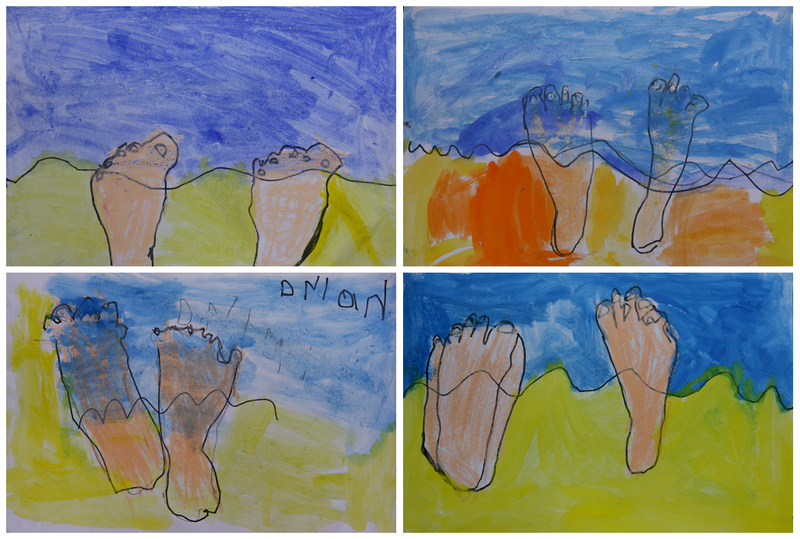 Each child traced around their own feet with a lead pencil (they loved getting their shoes and socks off). 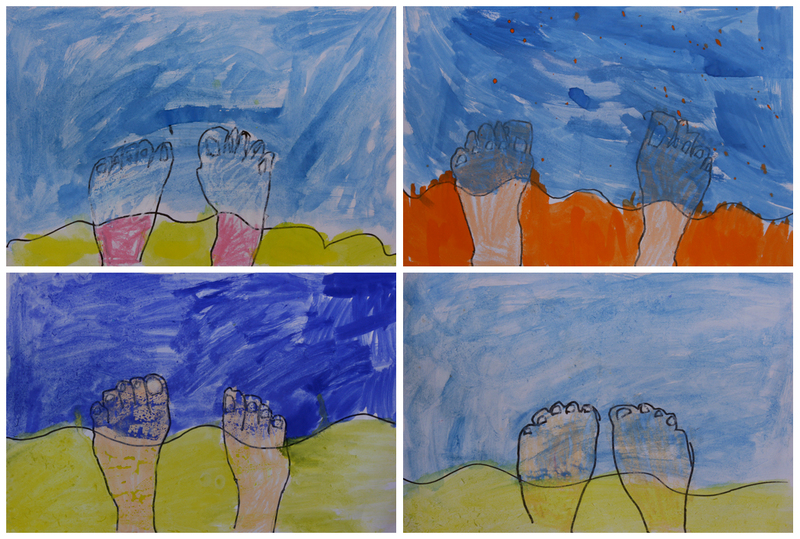 These pencil lines were then traced with a black permanent marker (I was trying to avoid them having marker all over their feet). They were also asked to add in their toenails and a gently waving water-line across their feet spanning from one edge of the paper to the other. In future I think I'll try and have the students allow for the bending of the water line as it curves over the feet. 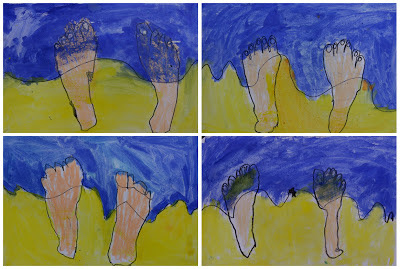 The feet were coloured with oil pastels before the sand and sea were blocked in with water colours. To be honest I've had little experience with water colours and I've never used them with kindergarten before. I'm pretty sure it was their first time too and they seemed to enjoy them. As I said I'm looking forward to better presenting this artwork as a lesson again one day. 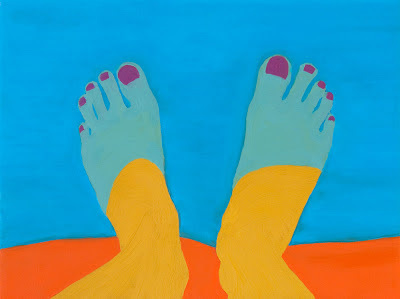 I'm thinking it could be great for colour-mixing with older students. Please share any suggestions you have! That is a really neat idea! 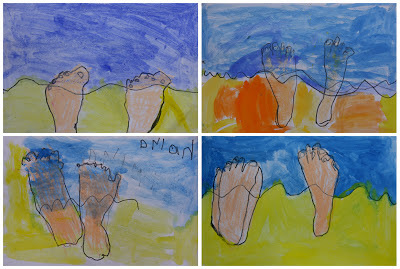 And, what a great piece to keep forever....those little traced feet won't stay that size for long! Joe, I think this lesson is adorable! One thing I would add is a little bit of eg going off the paper so they aren't disembodied feet, but kindergartner a wouldn't know the difference anyhow. Love the idea; Pinning! Well, those are just too cute. We are beginning our cool weather season, so I will pin these for around May! I know I've been seeing some great Autumn/Fall ideas on all the northern hemisphere blogs lately! This is such a fun and unique lesson! I'm going to have to try this sometime.